In today’s modern world, there are huge numbers of junk yards operating in most countries. Junk yards (also known as, auto salvage yards) are great places where unwanted vehicles are wrecked for parts and components. After which the dismantled parts are refurbished, recycled and sold. Furthermore, scrap car buyers are not just professional car scrappers but they offer a lot of other beneficial services as well. Basically, scrap yard is a place where you can dump your broken, rusty, scrap, accidental, or wrecked vehicle for the money. The best thing is that you can dispose your old vehicle for a good reason by using junkyards service. This way they contribute in managing waste in our surrounding environment. But there are still many people who are not aware of the benefits of choosing the auto dismantlers in Brisbane, Qld. If you are having any unwanted vehicle, then you might be searching for “old junkyards near me that buy scrap cars”. That’s the right time to contact Qld Wreckers. We are not like typical places where you can only dump and recycle your old vehicle. We buy a variety of vehicles that are no longer in a running condition. It could be of any make, model or brand. The same goes for the shape and size your junk automobile is in. 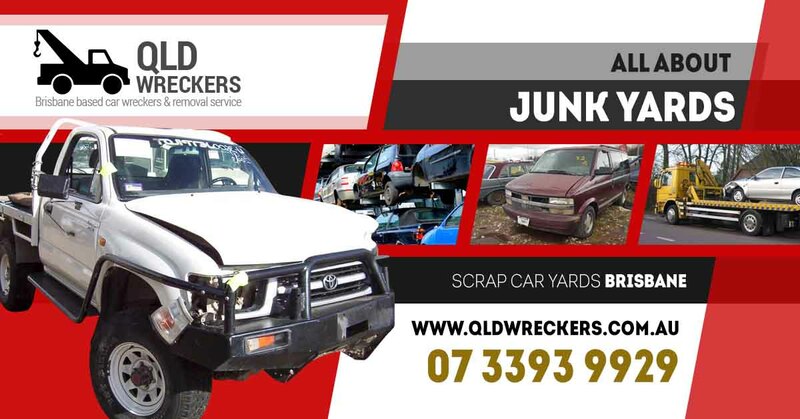 So, whenever you are wondering “How do you get rid of an old car?” Make sure to visit the team at Qld Wreckers to get the free scrap car removal in Brisbane and recycling service. Are you looking for junkyards near you that sell cheap parts? Maybe your used vehicle has broken down and you need the right parts at an affordable price. Well! Qld Wrecker’s Salvage yards in Rocklea are the best place where you can find a huge variety of second hand car body components. We have specialised experts and right equipment’s to dismantle scrap cars for parts. First, we make sure to sort out the usable components and then sell them to second hand vehicle owners. You can find all types of auto parts in our inventory including lights, seats, tyres, electrical components, doors, mirrors, windshields, trims, windows, and many other accessories. All of them are precisely refurbished and tested to ensure that we deliver the highest standard performance. If you have a broken automobile that need immediate repairs, it can be difficult to find the right parts at affordable rates. But if you locate the right scrapyard in Brisbane you can easily get the best quality components for your auto repairs. All you have to do is choose your favourite search engine and enter “second hand car parts supplier in Brisbane”. You will definitely get a number of options within seconds. Then, you can easily scroll through each auto part supplier and select the best one. When you choose a spare part seller, make sure to check if they get positive google reviews from customers. Also check the variety and quality of the parts they offer. And, the most important thing is to know if they provide pick a part service or full service. This means their friendly and helpful members will assist you in locating the right part when you visit their inventory. This will save your efforts and time to find the component yourself. There are many salvage yards who offer “you-pick” option. This means they will provide you a map using which you can locate your desired component. And, if you it suits your needs, you can remove it. However, there are also junkyards which employ friendly and experienced representatives like the team at Qld Wreckers. We will help you find the right car part with minimum hassle. How to choose a right car part from Junkyards? If you select “pick-a-part” option, make sure to carry the necessary tools. This will help you to carefully locate and remove the right components. Sometimes auto parts can accumulate rust and pulling them apart becomes really difficult. So, be ready to put considerable efforts and time to remove the right part. While picking some spares you have to scrutinize it carefully to ensure that they are properly functioning. Also, make sure that the components are not coming from badly damaged automobiles. Normally, when folks look to sell any old vehicle, they have to tow it away on their own. This is a simple job only when the vehicle is in a perfect running order. But when you are wondering “are there any car scrap yards near me?” You will obviously want to sell a broken down, junk, totalled, accident-damaged, wrecked or simply useless vehicle. In that situation, it can be difficult to tow away your unwanted auto to a junkyard. By keeping this in mind most salvage yard owners offer removal services for the sake of customer’s convenience. The best part of their service is that you don’t have to pay a penny to get your vehicle picked up. This means you end up getting a higher amount of money for scrapping your old car. How Much Do You Get for Scrapping A Car in Brisbane? Of course, most yards pay a fair amount money (from $100 to $500) for unwanted vehicles. Although they buy a variety of scrap automobiles but this doesn’t mean that they aren’t able to earn some value from it. They understand that even a damaged automobile has some monetary value. It is because they are able to find useful parts and accessories even in completely wrecked automobiles. How Much Do Scrap Yards Pay For Used Cars? Some people also like to sell their good running and second hand vehicles to the wreckers. As vehicle breakers are skilled in dealing with all types of vehicles used, broken as well as new. However, they follow same assessment procedure to find out the worth of a used car and it can go up to $10’000 based on make or model, condition and type (4wd, SUV, truck or van) of the vehicle. Sell your car to the wreckers and get the most value of your vehicle based on current market price. Whereas if you are interested to know “How much will a junkyard pay for a running car?” It can go up to a few thousand dollars based on the make, model and condition of your vehicle. If you choose Qld Wreckers, you can expect to get a handsome sum of cash up to $10K. Of course, you can sell any form or size of vehicle at a wrecking yard. It includes cars, vans, Utes, SUVs, trucks, 4wds and other heavy automobiles. And, if you are eager to know “what do you need to scrap a car? You must know its answer now. Basically, you just need to find the right company using internet or phone connection. And, the rest of the process is really simple. How to Get a Quote from Brisbane Auto Wreckers? Most junk car buyers aim at offering high quality service that renders utmost satisfaction to clients. This is why they give free cash quotes based on precise estimation of the vehicle’s value. Also, you need to accept the offer if it doesn’t meet your requirements. It is because you will receive it instantly and with no obligations. You just have to call them up and share major details regarding your vehicle like make, model, condition and age. With its help the wrecking yard company can determine a fair value of questionable automobile. Remember only reputed and experienced auto dismantlers like Qld Wreckers give best cash quotes. So, next time if you think about “junkyards near Brisbane that buy cars”, choose none other than Qld Wreckers. How to Contact Brisbane Auto Wreckers? Just contact Qld Wreckers using the online enquiry form placed on the website or dial our contact number which is 0416 615 100. Once you do it, you will get an immediate response from the friendly representatives at junkyards near you.